Stress and anxiety can have debilitating effects on a human's health. Stress in cats acts much the same way. Not only can it exacerbate existing physical conditions, but it can lead to a number of problems often considered behavioral, such as litter box avoidance, aggressive behavior, or depression and withdrawal. When behavioral problems suddenly appear, savvy cat owners soon learn to look first for signs of health problems, such as urinary tract infections with litter box avoidance, and next for stress factors, such as changes in the environment. Why Do Cats Have Anxiety? Veterinary visits. Many cats are frightened and stressed during vet visits. Using a crate to transport your cat is essential and putting a light blanket over the crate until you are at the vet's office may help mask the steps of the journey. New family members (human or animal). Cats may react in a number of ways to new family members. 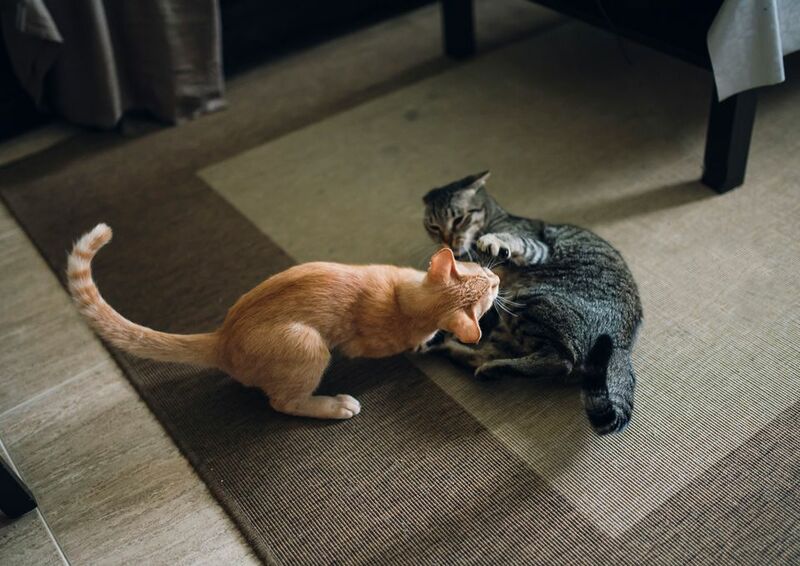 By understanding this and planning ahead, the concerned caregiver can help the cat avoid the stress of a sudden introduction while letting the cat know that it is still important. Introducing a new spouse or human roommate calls for understanding and patience. The newcomer needs to allow the cat to come around at its own pace and to avoid trying to rush the relationship. Moving to a new residence. Moving calls for care in seeing that your cat's life is disrupted as little as possible. During a local move, it helps to keep your feline closed off in a separate room with a favorite "blankie," toys, litter box, food, and bed, while the rest of the house is moved. Bring the kitty and all their belongings to the new house or apartment, where you will put it in a "safe room" while you unpack and rearrange the rest of the household. Having its own things around will help your cat understand that this is home. A long-distance move is better handled with help. Have one person go ahead to the new residence and set up the kitty's safe room. The other will accompany the cat in a carrier with a favorite toy or "blankie," whether by plane, train, or automobile. A change in daily routine. A new job or other change in daily routine should also be handled by planning ahead. A week before starting work, start leaving for the day for gradually increasing periods of time. Upon your return, make a big deal over your cat. Carry the cat around, pet it, and ask how their day was. By the time your job starts, your kitty will be quite accustomed to your absence during the day. Loud parties and noises. Holidays are particularly stressful for cats, especially those which focus on fireworks, such as the Fourth of July. Large parties with the doorbell constantly ringing, accompanied by loud music, talking, and laughing will usually send even the most sanguine cat running for cover. The view through the window. A review of external stressors would not be complete without mentioning re-directed aggression, a sudden and often inexplicable phenomenon which is more common than realized. Re-directed aggression often happens when a household cat is sitting on its favorite perch, gazing out the window. Suddenly it sees a strange cat stroll through the yard. Frustrated because it can't get outside to defend the territory, the cat will suddenly attack the closest being, whether it is another resident cat or a hapless human. Dealing with this form of aggression calls for creative thinking, which includes keeping your cat away from that window or somehow barring the view, while taking steps to discourage the strange cat from further exploration in your yard. For dire circumstances, you might consider using a commercial cat repellent. Fear. Fires, earthquakes, hurricanes, and tornados are classic examples of fear-resulting stressors. Although many of these environmental stressors cannot be predicted, it is still essential to have a plan for dealing with an emergency before it happens by preparing your cats for disaster. Predictable fear-associated stressors, such as noisy festivities like Halloween, 4th of July, New Year Eve, can be planned for ahead of time. Keep cats confined to an interior room on such occasions, with low lights and soft music playing. Fear also is sometimes exhibited when one cat is being "picked on" by another. A classic example of the factor is the cat that is "trapped" in a closely confined litter box by another cat. The end result, of course, is litter box avoidance. You can help ameliorate this situation by giving the "victim cat" its own uncovered litter box with plenty of opportunities for escape. Rivalry or jealousy. Rivalry and jealousy take place more often with the introduction of new cats to the household. You may also see a certain amount of rivalry and jealousy as kittens grow into adulthood and they sort out their "pecking order" in the household feline hierarchy. Often the best solution is just to leave them alone. Cats have a wonderful way of working things out, and once the alpha cat is established, peace will reign again. Sudden rivalry and jealousy between two previously friendly adult cats is another subject. It can be more often caused by some environmental change, which will take a bit of detective work on your part to discover. Stress is a big factor in managing the health of a senior cat, or any cat with a serious physical condition. Cats with weakened immune systems, such as FIV or FeLV patients, do not thrive under stress. Older cats and cats with a chronic and/or terminal disease do much better in a quiet setting, with a minimum of environmental changes. It would be very unwise to bring home a new kitten or a noisy dog under these circumstances. A hospital or hospice situation with tip-toeing and hushed voices is not necessary, but loud noises and sudden movement should be avoided, if possible. If there are children in the house, a discussion might be in order, not only to enlist their help in reducing stress to the older feline patient but also to help prepare them for what will inevitably come. If you can determine the source of the stress, take measures to ease your cat's anxiety. By eliminating the stressor, you will stop the anxiety in the cat. This may be in the form of a new litter box, closing the window shades, or no longer hosting loud parties in your home. Natural remedies such as herbs, flower essences, or homeopathic remedies may help in reducing cats' stress and anxiety. Introduce only one remedy at a time, and check with your veterinarian first before trying any of these products. Remember, that one of the most important things you can do to minimize stress in your cat is to keep your own stress level down. A hot cup of herbal tea, a glass of wine, or a hot bath might be just the thing you need on some of those days when you find yourself "telegraphing" your own stress to your cat.